We live in a world where a significant number of people operate on the principle that what matters most is to seize that which has the highest present value. And this is a phenomenon that has not bypassed the arts. Unfortunately so, I might add. The long years of preparation, growth and blossoming come off second best to the glamour of the "here and now". And yet, true greatness is time-tested and it is timeless. Great artistes are not just recognised as such by erudite panels. They arrive and live among us like close relatives or cherished friends. Today the world of music has moved into larger spaces and in new directions, helped of course by technological innovation and the "discovery" that all things, including art, are marketable. As such there is a veritable mushrooming of artistes; singers, performers, film-makers, musicians and writers are scrambling over one another to win that critical piece of the market that will ensure their survival in the industry, often with hardly a thought to the nurturing and sensitizing purposes of the creative exercise. These are the ones who come and go like the sporadic cloud that teases us as it travels across our skies. There might be a scattering of rain drops, but they can never coax the skies to break into a deluge with the megha raag. Rohana Weerasinghe, would be among the precious few who stands apart from this crowd when it comes to the Sinhala music scene today. He has as a singer, an instrumentalist, and a composer, made rich the field of Sinhala music for over three decades now. Undoubtedly an icon in his chosen field, this unassuming and charming musicians life and career had humble beginnings. Born in the salubrious climes of Nuwara Eliya, he had his early education at the Good Shepherds Convent and the Vidyachakra Buddhist School. It was however at Welimada Central that he began his music education, under the tutelage of K. V. S. Perera. After completing his education at Dharmapala Vidyalaya, Pannipitiya, Rohana began to think more seriously about a career in music. When he entered the Aesthetic Studies Institute in 1969, cradling a sitar, his one dream was to become a singer. During this time he got many opportunities to perform as a back-up singer in various radio programmes. On some occasions he would have to come up with his own melodies. However, while his contemporaries received accolades for their singing talent, for some reason what was stressed about Rohana were his compositional brilliance and his skill as an instrumentalist. It is perhaps as a result of this that he gradually moved from singing to almost exclusively concentrating on composition. It was as a singer that he participated in the radio programme Udaya Geetha (morning songs), where he sang Budu Saranai Navodee. Later he composed the melody for Ran tharu mini muthu, which he sang with the late Malini Bulathsinghala. This was the first melody that he composed. Rohana Weerasinghe, who began his career in music in this way, has now recorded thirty years of creative contribution to Sinhala music. It is indeed a travesty of justice that this gentle artist whose creative energy knows no bounds has been subjected to serious assessment only once during those long years. I believe this has more to do with his humility and a conscious desire to remain behind the wings, so to speak, than anything else. He confessed that there were other reasons as well. "In 1991, the Saharda Sanvada Kendraya organized an event to appreciate my work. I had an idea of collecting the more popular of my songs in a CD when I reached the age of 50 on the 18th of February 1999. Some of my closer associates, arguing that one CD was not enough, suggested that I do two. Due to financial constraints the project was abandoned half way through. "Then I thought I would plan for my next birthday. 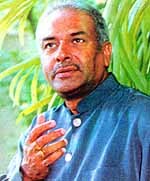 But a festival of films for which Victor Ratnayake did the music was organized for that very day, which also happened to be Victors birthday. So I stopped all my work to support his project. I did not allow anyone to know about this, however. This year will see the fruition of my idea. I have to say that this is mainly because people like Kularatne Ariyawansa, Saputhanthri and other friends of mine. "Along the way, something else happened. Ravi Siriwardena and Samudu Wettasinghe came up with a collection of my compositions and critical essays of my work. I never asked them to do this. The book includes various facets of my life and career and I believe would be of academic value to those interested in the field of Sinhala music as well. Of course I was very happy about it." Thus, on the 25th of February at 3.00 pm, this book, along with Rohana Weerasinghes 2 CDs, and another book containing the scores of his popular songs was launched at the John de Silva theatre. The ceremony was being organized by the Saharda Sanvada Kendraya. Ratna Sri Wijesinghe, Sunil Ariyaratne and Victor Ratnayake were due to speak on this occasion be chaired by Pundit Amaradeva. Compered by Kolitha Banu Dissanayake and Bandula Nanayakkarawasam, the event featured performances by Nanda Malini, Sunil Edirisinghe, Edward Jayakody, Neela Wickramasinghe, T. M. Jayaratne, Karunaratne Divulgane and Janaka Wickramasinghe. The event was sponsored by Karu Heenatigala of the Heenatigala Group. Parallel to this, a concert was held on the 26th at the BMICH from 7.00 p.m. onwards, featuring 40 singers and an orchestra of 45 persons, under the joint sponsorship of the Bandaranaike Commemoration Foundation and the DSI Group. I asked him to point out the most memorable moments of his 30 year long journey. "About the songs...the landmarks are of course those which enjoyed popularity. It would take more than a page to set down all that I have to say about them. However, there are certain compositions that I have made for films which I can definitely mention. The background music that I composed for Wasantha Obeyasekeras Theertha Yathra, Ashoka Handagamas Me Mage Sandai, and before that, Aradhana (1982), Saharave Sihinaya (1991) were certainly memorable. I won the OCIC, Swarna Sankha and Sarasavi awards for Saharave Sihinaya. I also won State Awards for the background music that I composed for two stage plays, Ashoka Handagamas Maghatha, and Jayalath Manoratnes Thala Mala Pipila. "I also believe that the music score I composed for Nalan Mendis Hiru Kumari, a tele drama which has not yet been released, would prove to be special." I wondered if Rohana Weerasinghe ever felt that the younger generation would move away from him with the advent of new forms and trends in music. "No. Fads and trends and by definition are always temporary. We are a people who built ourselves upon a firm foundation. Our creations are strong. That some of the melodies I have composed for the artistes of the younger generation enjoy immense popularity amply demonstrates this. A lot of young artistes come to me with their lyrics, requesting that I put music to them. "I believe that there are enough young people in our country who thirst for good compositions. They do not gain much exposure partly because the media sometimes engages in publicising the mediocre. There was a time when the radio played an important role in creating a good and critically appreciative audience. Television changed all this. Our role is to generate a mature audience and not to stand aside and watch them being carried away by cheap and temporary fads. Our efforts focus on this." At a time when the hollow and empty is celebrated over things of substance, where the surface is skimmed almost as an article of faith and depth has no meaning, Rohana Weerasinghes contribution to Sinhala music is a testimonial to the worth of the abiding. As he celebrates his thirtieth year in the field, it would not be inappropriate for us to be grateful. For the tender tenacity that his work exemplifies is what sustains the fundamentals of our ethos, without which we are nothing.